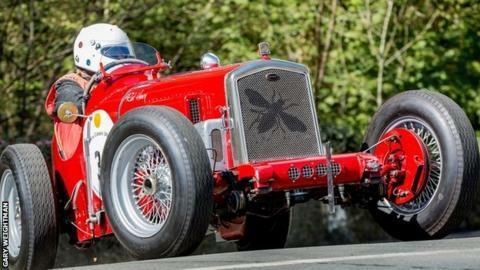 A record 95 vintage, classic and modern sports cars have begun the Manx Classic sprint and hill climb on the Isle of Man. The three-day event will see cars racing in three separate stages across the island. The event opened on Thursday with the Governor's sprint, with cars racing on a stretch of the famous TT course. It will continue with the Sloc hill climb later before Saturday's final stage, also on the TT course. Manx Motor Racing Club secretary Shely Bryan said the cars range from a 1925 Austin 7 to a 2014 Volkswagen Golf. She said: "We've got some very interesting machinery taking part this year. "We've got a great entry this year with more than 30 pre-World War Two vintage cars taking part and cars spanning a century of motoring." Last year nine course records were broken out of a possible 12 at the event organised by the Manx Motor Racing Club. Meanwhile, three-time British Rally champion Mark Higgins used the event to demonstrate the 2015 Subaru WRX STI in which he will attempt to break his own TT course lap record in June. The Manx rally driver set his current record in 2011, lapping the 37.75-mile (60.7km) course at an average speed of 115.36 mph in a Subaru WRX STI.